Not a month in office and the declaration of war against most of the City Council by the new mayor comes with some extraordinary ventures outside the Mile Square City. Mayor Ravi Bhalla is the man about town, scratch that, man about country. He's managed to fit in not one but two major trips with a month in office and the question is being raised, does he intend to stiff Hoboken taxpayers with those bills? The first trip was to Washington D.C. Did Mayor Bhalla appear before an important urban congressional committee on transportation or flooding to urge support for initiatives on behalf of Hoboken. Nope. It was a Democratic House "retreat," re: pure unadulterated politics. He did however note in one tweet he is "sharing knowledge of Hoboken election lesson to help Dems win the midterms." Outlaw "sanctuary/welcoming" cities being all the rage these days. How much lawbreaking will be helpful in November? Latest polling shows the trend for illegality coupled with massive illegal domestic spying for election purposes and higher taxes is not enhancing any resumes with American voters. This followed with another trip with a South Asian moms get together in Austin, Texas. The jaunt there as one tweet described also saw Mayor Bhalla meet with a local mayor to discuss "housing affordability... new technology in bike sharing programs" and taking "lots of notes." Questions are flying around town asking will the Hoboken taxpayer be hit with the cost of these obvious political and personal junkets? Ironically, on housing affordability, the Hoboken Rent Leveling Board is in a state of flux awaiting direction, leadership and appointments by Mayor Bhalla. Meanwhile, a Texas mayor needs to share with Mayor Bhalla on the subject elsewhere? What, you guys can't Skype with each other after attending to Hoboken city business? On the plus side, Mayor Bhalla did manage to make an appearance with the NJ Senators for a media event at the Hoboken train terminal. Lots of grandstanding and the usual blame game pointing to President Trump for the accident that occurred before he was even on the scene. Well, there's some attention on sleep apnea or something. How much government money do you need to add that into an annual physical and/or with drug testing? The Hoboken Housing Authority held a regular dinner and there was a nice appearance by the new mayor. He didn't make many of these events or HHA meetings previous so perhaps this is an effort at outreach. It fares better then a rare HHA meeting appearance where a Florio Perrucci contract was up for a vote as then councilman Ravi Bhalla did before becoming a member of that law firm. One local official wasn't as thrilled to see the mayor. Something about a blunder attacking a majority of the City Council with wild accusations about voter fraud. Let's just say that much of the council members weren't even around when the backtracking pointed to a 2010 council race. Worse, the people skewered were more than a little vocal at the last meeting speaking out against Hoboken voter fraud. One council member, Michael Russo managed to escape the wrath of Mayor Bhalla on voter fraud. This with the mayor's statement speaking out against the practice of paid election day workers. Somehow, the 2015 race which Russo faced unopposed spent boatloads in the thousands for election day workers. Nice that Ravi-Russo alliance. Then there's this from Mayor Bhalla twitter page. A meeting he described as "exciting." 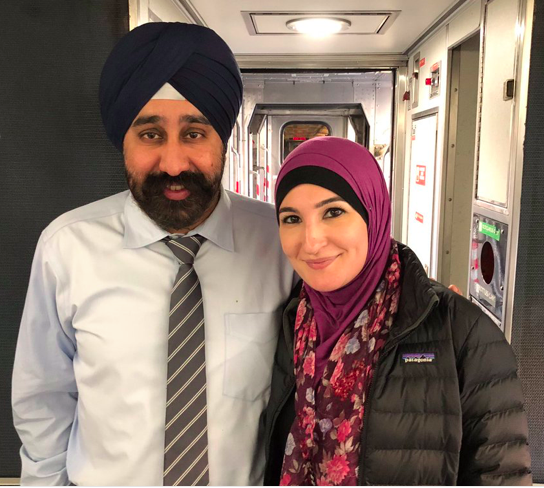 Mayor Ravi Bhalla posed for this photo with controversial anti-Israel activist Linda Sarsour. Sarsour was in the news recently for denying a woman's allegation of sexual abuse in the workplace. to be quiet about the incident body shaming her saying it "doesn't happen to someone who looks like you." Left wing anti-Israel activist Linda Sarsour saw a photo celebrated with Mayor Bhalla on his twitter page. She's been an icon of the Left "leading" the woman's march protesting the election results of President Trump after his come from behind victory in November 2016. If Mayor Bhalla wanted to get off to a shaky start with the City Council and Hoboken public, he's certainly off to an interesting stage left beginning - to put it kindly. 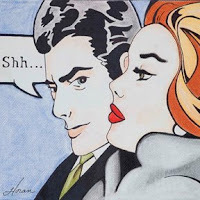 Talking Ed Note: Happy Valentine's Day to all except for the rancid pathologically lying few in the Cave, Hoboken Antifa and their related chapters.